Want to find out the WiFi password for the airport you are in for free Internet access? 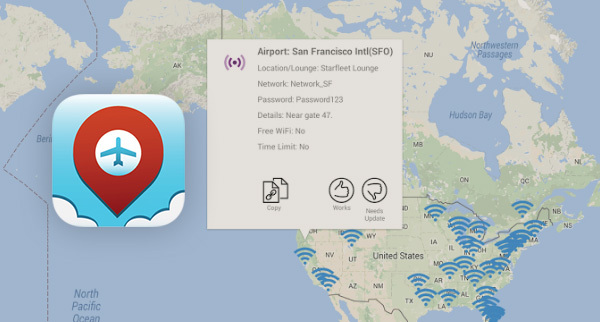 WiFox’s crowdsourced database of airport and lounge WiFi hotspots and their associated passwords should help. If you’re a frequent flier, then you will already know that airport WiFi is never cheap and when you do cough up the money to get online, it’s usually far from fast and is about as insecure as a public hotspot can get. All in all, we are not fans at all of airport WiFi, and even more so when we have to pay through the nose for it, but there may be another way to get online. WiFox is an app that’s available for both Android and iOS, and while it’s not free, the $2 asking price is still considerably cheaper than the average WiFi price at somewhere like a Heathrow or JFK. Bear that in mind before you baulk at the thought of paying for an app that’s main use is to find free WiFi access points within Airports. At its core, WiFox is a crowdsourced database of WiFi hotspots and the associated passwords that people need in order to access them. Being crowdsourced, the app allows for users to have their say on the accuracy of the data WiFox holds, which in turn makes for a more accurate, and more useful app. 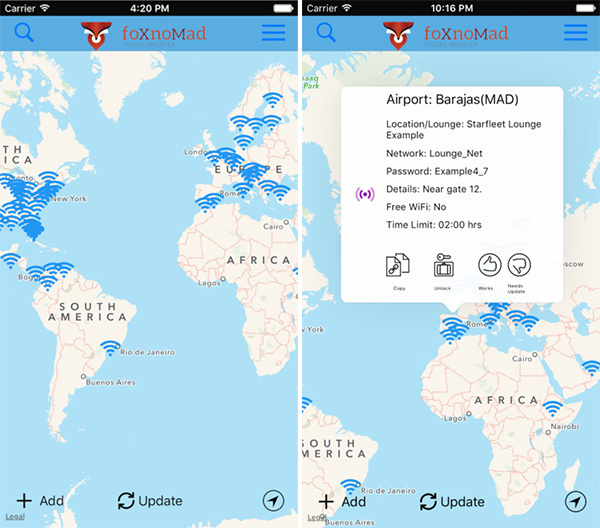 WiFox is a continually updated map of airport and lounge wifi passwords from around the world. In map view, you can tap any wifi icon where wireless information is available, and use the button to copy the password to the clipboard. With data from around the globe, WiFox should be able to get you online no matter which airport you happen to be in at the time. The majority of these access points are in the lounge, so this may not help if you’re nowhere near that area of the airport, but in a pinch, any WiFi is better than no WiFi. Sometimes, we can only be thankful for small mercies, especially in an airport! Are RP getting paid to promote this app as the App Store reviews say it is awful. Not to rain on your parade, but in the USA isnt this unauthorized network access and computer fraud?